There was some buzz about Pinot Noir Blanc at this year’s International Pinot Noir Celebration, with a number of participating wineries offering this wine as part of their 2010 lineup. It seems to be an Oregon fever, as very few wineries in California are currently producing it. The pulp and juice of the Pinot Noir grape are nearly clear, and most of the aromas, flavors, and all the color of Pinot Noir comes from the grape’s skins. Pinot Noir Blanc is a white wine produced from Pinot Noir by pressing the grapes after harvesting before any significant skin to juice contact occurs. Depending on the handling of the juice, the resulting dry wine can be lean and crisp or full-bodied and highly flavorful. In either case, Pinot Noir Blanc features primarily white wine flavors: Pinot Noir without the Noir. The wines display a white gold to golden copper color. Pinot Noir Blanc should not be confused with Pinot Blanc which shares the same DNA as Pinot Noir but is a genetic mutation that is a white grape. It is similar to Chardonnay and wineries often vinify it either in stainless steel or oak barrels, with or without malolactic fermentation, like Chardonnay, depending on the stylistic goal. Tony Soter at Etude pioneered Pinot Blanc in California and numerous wineries in Oregon produce exemplary versions. Still another variation of white Pinot is the Bourgogne Pinot Blanc produced by Domaine Henri Gouges in Nuits-St.-Georges. Pinot Noir is known to be prone to mutating, and in Gouges’ vineyard, a separate cultivar emerged over 70 years ago which is a white version of Pinot Noir, but not thought to be the same as Pinot Blanc, although it has been labeled that at times. The French also produce Blanc de Noir from Pinot Noir and Pinot Meunier, but it is a clear sparkling wine. Although now popular in the Willamette Valley, Pinot Noir Blanc was not invented in Oregon. I know of examples produced in California by Joseph Phelps going back to the mid 1970s. Quantities have always been small, and there has never been a large market for Pinot Noir Blanc. None of the common references on wine even mention it. Some consider it a bastardization of Pinot Noir. The emergence and popularity of Pinot Noir Blanc in Oregon arose from several sources. In the cool vintages of 2010 and 2011, some grapes did not reach the full phenolic ripeness desired for Pinot Noir and winemakers found a use for the grapes other than Rosé. The quality of these Pinot Noir Blancs usually reflect the use of less than premium fruit. Other Oregon producers saw an opportunity to compliment their Pinot Noir with a white wine when Chardonnay grapes were not available. Chardonnay has not been particular popular in Oregon, anyway. Any wine with “Pinot Noir” in the name holds interest for the consumer, and like Pinot Noir, the wine is also quite food friendly, pairing well with a wide range of appetizers, salads, charcuterie, cheeses (brie), and white-sauced pasta, and seafood, depending on the style of the wine. Domaine Serene, through its marketing power, brought Pinot Noir Blanc to the attention of the Oregon wine community. Pinot Noir Blanc was a central player in the acrimonious parting of winemaker Anthony Rynders from Domaine Serene in 2009. Domaine Serene began producing a serious Pinot Noir Blanc called Coeur Blanc in 2003 and it quickly caught the interest of consumers. A number of allegations were made by Domaine Serene against Rynders when he chose to leave his position there as winemaker, but the main issue was the winery’s winemaking process used to produce Coeur Blanc from Pinot Noir grapes. Domaine Serene was concerned that Rynders would use the winery’s proprietary winemaking process to make his own competing Pinot Noir Blanc. Rynders argued rightly that the method of making white wine from Pinot Noir grapes is not proprietary and is common knowledge to trained winemakers. The challenge was settled when Rynders agreed not to produce or consult on a Pinot Noir Blanc for three years. 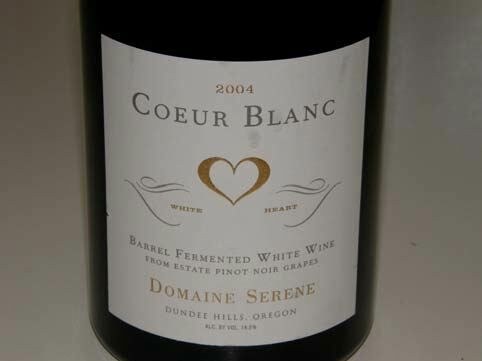 Domaine Serene recently released its 2010 Coeur Blanc ($85), which is barrel fermented and made from 100% estate Pinot Noir grapes. The grapes are gently whole-cluster pressed, with minimal contact with the purple grape skins so that the purest essence or “white heart” (the French translation of Coeur Blanc) is expressed. The juice is barrel fermented on the lees in 30% new French oak for 15 months and further aged for a year in bottle. 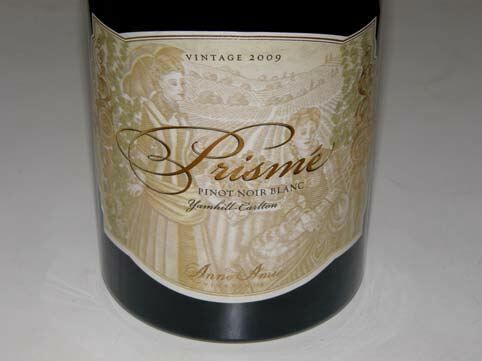 Anne Amie’s Prismé is not inexpensive ($45) but in the style Houseman prefers, it is challenging to produce. Houseman says, “It is a bit of a beast to make and a nightmarish labor of love.” It requires the same crew and winery equipment as needed to produce premium Pinot Noir. The grapes are carefully sorted as they go into the press. The grapes inside the press have a maximum of five minutes skin contact before the press is emptied. The juice is settled overnight, then racked into French oak puncheons (25% new), when several aromatic yeast strains are used to ferment the juice to dryness. This is a slow process. Once primary fermentation ends, the wine goes through full malolactic fermentation and lees stirring until the richness, viscosity and toasty flavors are achieved. At this point, the wine is racked to neutral barrels and aged on the lees until bottling for a full 18 months. You can have plenty of fun playing with Pinot Noir Blanc for it will challenge your senses. I encourage you to try it. 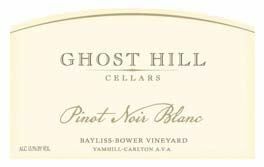 Here is a list of some Oregon Pinot Noir Blancs. Production is small, so the wines are often only sold at the winery. 2010 Trisaetum Nuit Blanche Willamette Valley Pinot Noir Blanc $32. A popular Pinot Noir Blanc from California is the Belle Glos “Oeil de Perdrix” which is labeled a Pinot Noir Blanc but is more a rosé in color and style. The name is derived from the French who call this style of rosé, oeil-deperdrix, or “eye of the partridge.” It is believed to have originated in the Champagne region of France during the Middle Ages to compete with the fuller bodied wines of Burgundy. The wine is a speciality in Switzerland, a dry rosé made from free run juices of Pinot Noir. The French term, Vin gris, is also applicable here. Belle Glos claims that the Wagner family has made this style of wine for more than 35 years. Pinot Noir juice is pressed quickly after it reaches the right level of color, then partially fermented in French oak barrels resulting in a full-bodied rosé style of wine that has both red and white fruit aromas and flavors and is relatively low in alcohol. The source of grapes for this wine has varied, but the current 2011 release is from Sonoma County ($19.99). Like the other Belle Glos Pinot Noirs, the wine has an attractive large dip of wax, pink in this case.